St John’s College has committed significant resources in a variety of environmental areas over recent years with a great deal of success. These initiatives include measures to reduce energy consumption and emissions of Carbon Dioxide (CO2), improve recycling (see College recycling points), and reduce water consumption. The College has an environmental policy which seeks to direct College activities towards a sustainable approach. Our Environment Committee was established in 2007 and reports to Council on a regular basis to ensure sustainability is a proactive and continually improving aspect of the College. St John’s College recognises the potential negative impact of its activities on the wider shared environment and seeks to minimise this impact to the lowest possible level, whilst not exceeding excessive cost. 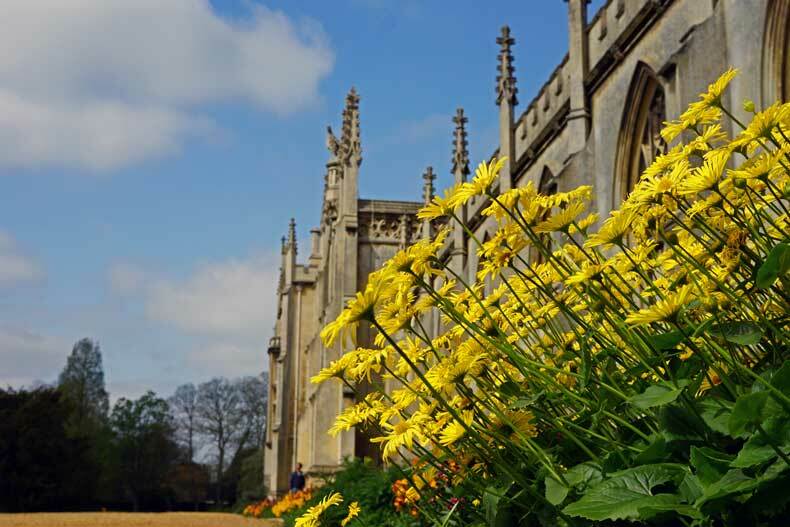 St John’s College realises that sustainability is not a one-time organisational initiative but a deep-rooted outlook for the wellbeing of future generations. The College will therefore seek to continually improve its environmental performance and will routinely review its progress, and this policy, to position itself at the forefront of responsible environmental practice. St John’s College will comply fully with all relevant environmental legislation and will actively promote environmentally conscious behaviour from all members of College staff, students, Fellows and guests. The College will continue to manage environmental initiatives and report to the Council through the Environmental Committee. Implementation of initiatives will be through existing College structures and relevant Committees where possible. St John’s College will take steps to inform itself of excessive consumption in all areas and implement measures to mitigate this where practicably possible. The College will actively pursue all energy and water reduction initiatives that are deemed practical to implement and economically viable. The College will incorporate energy and water efficient measures into its long-term strategic development. Whilst not practical at this stage, the College does recognise the benefits of setting realistic targets. The College will announce such reduction targets at the earliest possible time. Where practicably possible, St John’s College will seek to divert waste from entering landfill by following the widely recognised Waste Hierarchy. It will look to reduce the amount of potential waste entering the College system (by purchasing items with reduced packaging), re-use items at all opportunities (utilising such schemes as composting), recycle unwanted waste (by correctly segregating waste into relevant streams), and only as a genuine last resort should waste be destined for landfill. The College will responsibly dispose of white goods, electrical appliances and IT equipment, in accordance with current legislation. St John’s College will promote a purchasing policy that gives preference for goods and services from environmentally friendly sources, should this be considered economically competitive. This will maximise the use of local business to reduce harmful emissions from excessive transport. The College will mitigate the use of hazardous substances in line with current legislation. St John’s College will take steps to promote the use of environmentally friendly transport, both for business use and commuting to work/study. This will include encouragement for public transport, cycling, and a reduction in the use of College vehicles. 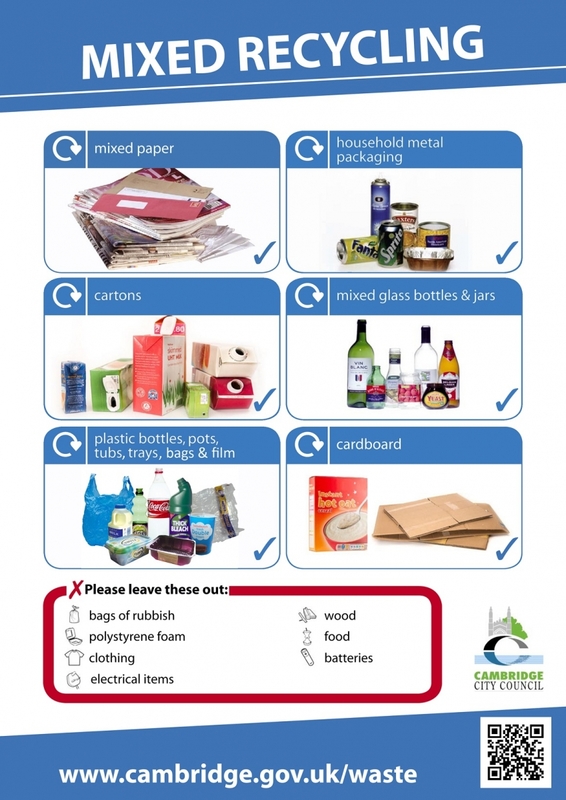 There are more ways to recycle waste in Cambridge than you might think. 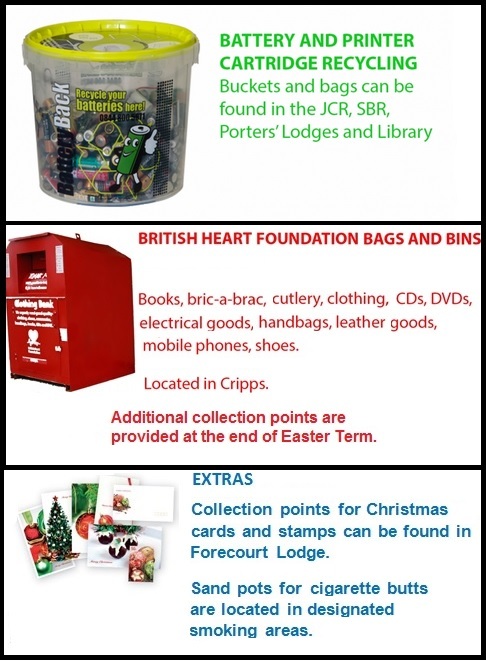 As well as standard blue recycling bins, which will take many items, other materials can also be disposed of in red British Heart Foundation bins and battery recycling buckets. St John's is currently working to increase recycling rates and there are plenty of recycling points throughout College premises. 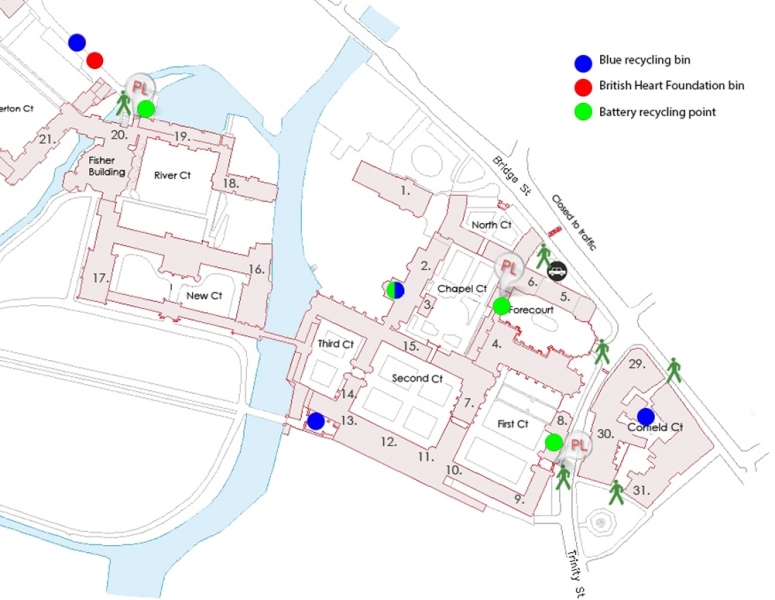 Below is a map of where you can find recycling points on the main College site. All Hostels have independent recycling facilities, provided by the City Council. Buckets and bags can be found in the JCR, SBR, Porter's Lodges and Library. Books, bric-a-brac, cutlery, clothing, CDs, DVDs, handbags, electrical goods, leather goods, mobile phones, shoes. Bins are located in Cripps. Additional collection points are available at the end of Easter Term. Collection points for Christmas cards and stamps can be found in Forecourt Lodge. Sand pots for cigarette butts can be found in designated smoking areas. In addition to the main projects listed, the College takes every opportunity during refurbishment work and routine maintenance to reduce its environmental impact. This includes items such as energy efficient light bulbs and boiler upgrades. This timeline will be updated as further projects emerge.